Abstract Pursuant to the statistics data of Eurostat, the economy of European Union is slowly recovering from year lasting recession. The gross domestic product volume increased in 2 nd quarter of the year 2013 by 0,3%. The industrial companies in EU are nevertheless facing still increasing competitiveness as the European and global markets are developing under current business conditions. To be successful within the frame of current supply chains the companies must have welldeveloped logistics management systems to effectively treat with flows streaming in their inner or outer supply chains. One of the main elements of company logistics management systems is inventory management subsystem to plan, to manage and to control particular stock items. 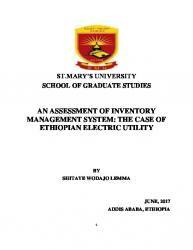 In the paper it is briefly described the methodics to design effective inventory management system whether in industrial or service company (Hart, Musil & Taraba, 2014). 1. INTRODUCTION With the rapidly increasing understanding of logistics importance for business, companies and infrastructures, especially when optimization of all resources and increasing of profit is identified as its major task, the importance of inventory management is also gaining more recognition. All companies are under big competitive pressure in today’s business environment. To gain competitive advantage is often necessary to effectively reduce costs. Inventory management, or inventory control, is an attempt to balance inventory needs and requirements with the need to minimize costs resulting from obtaining and holding inventory. Inventory management is an attempt to maintain an adequate supply of goods while minimizing inventory costs. To effectively manage inventory is good to have well-developed forecasting system as a supporting tool to make managerial decision. As soon as there are data on future demand or consumption and those data are accurate so it’s easier to manage inventory, whether raw materials inventory, semi-finished product inventory or final product inventory. It’s important to realize that the inventory constitute considerable cost item of any company. (Hart & Lisakoviča, 2011), (Hart, Musil & Taraba, 2014). For illustration, the evolution of world’s economy indicators along first decade of the 21st Century had positive growing trend, see figure 2. In the figure 2, it can be seen the global economic crisis of 2008 and 2009 which caused the total merchandise trade decline thereby also the world’s GDP decline but positive growing trend of world’s economy indicators, in the first decade of the 21st Century, is evident. In consequence of globalization trend and increasing level of competitiveness, the companies across particular supply chains apply in their management systems process approaches. Enterprise management systems are increasingly using logistics management principles and techniques. The result is that the logistics as a science is getting more and more important and it can be classified in industrial sphere as: • purchasing logistics, • production logistics, • packaging logistics, • warehousing logistics, • distribution logistics, • reverse logistics. By the globalization trend is just not affected industrial sphere but also tertiary sphere, where can be recognized very important and perspective logistics science discipline, city logistics. In context of mineral resources decrease and increasing importance of environment protection is further defined logistics science discipline, green logistics. Therefore, the logistics science approaches to plan, manage and control, are crucial as for organizations of industrial sphere so for the organizations of tertiary sphere to make effective decisions in cost and eco-friend way under long-term sustainable growth conception. The increasing signification of logistics science for economy is also emphasized in scenario study “Delivering Tomorrow: Logistics 2050” by Deutsche Post DHL published in February 2012. In that study are defined 5 scenarios of life in the year 2050, taking into account essential factors such as globalization trend, economic and social development, state of the art and environment conditions. In all 5 built-up scenarios: • scenario 1 – Untamed Economy, Impending Collapse, • scenario 2 – Mega-Efficiency in Megacities, • scenario 3 – Customized Lifestyles, • scenario 4 – Paralyzing Protectionism, • scenario 5 – Global Resilience, Local Adaptation. the logistics science plays significant role for the economy. All scenarios have got common feature, considerably transformed role of logistics. The total demand of logistics services is growing in most of 5 scenarios but special requirements asked the logistics companies to perform are largely different. “Logistics is about creating value – value for customers and suppliers of the firm, and value for the firm’s stakeholders.” (Ballou, 2003). and up to 50% of capital in business companies (Pernica, 2005). The inventories are comprehended as natural constituent in manufacturing and distribution companies. The inventories are occurred in quite number of supply chain stages – e.g. raw material inventories, component inventories, work-in-process inventories and final product inventories, see Figure 3. Fig. 3 The Possible Points in Supply Chain to Accumulate Inventory (Ballou, 2003). The inventories are the factor which significantly affects operating results of any company thereby also its market position. The inventory level should be on the one hand the lowest possible due to locked-up capital but on the other hand it should be the highest possible to maximal service level. Both standpoints are contradictory therefore the company management must choose between them particular compromise. The investing in inventories often represents one of the highest financial items of companies therefore the decision regarding on inventory management system is ranked among strategical decisions (Horáková & Kubát, 1998). Within the frame of free market economy it’s rising inventory importance and their effective management. Inventory management should lead to optimal inventory level. What does it mean for company? It’s in principle a choosing and a finding of optimal relation between inventories function and connected costs. It stands to find optimal relation among single cost types which are concerning of inventories. Some types of cost are rising with increasing inventory level, other on the contrary are deduced. To ensure competitiveness of company in long-time horizon, it’s necessary to have well-developed inventory management system of particular stock keeping units (Horáková & Kubát, 1998), (Hart, 2010). The warehousing can represent 20% to 40% of stock keeping unit value (Ballou, 2003), (Hart, 2010). The main aims of inventory management system are to optimize customer service level, inventory level cost and operating cost level (Hart, Taraba & Tomaštík, 2014). 4. PUSH AND PULL INVENTORY MANAGEMENT STRATEGY Push strategy to manage inventory is suitable for system design of inventory management where a manufacturing and procurement are predominant powers to determine require inventory level and optimal supply frequency. This strategy it’s possible to describe by 5 following points. 1. Demand or consumption forecast calculation, 2. actual inventory level assignment in particular warehousing locations, 3. total demand or consumption calculation + safety stock calculation to smooth variation 4. net demand calculation as a difference between total consumption and current inventory level in warehouse facilities, 5. allocation of net need of items into single warehousing locations on the basis of average demand (Ballou, 2003). The strategy of inventory management pull is approach which takes a look at each part of supply chain as an independent on others. The forecast creation and supply lot size determination are realized on the assumption that it takes into account only local conditions. Fig. 4 Inventory Management Strategy Push and Pull (Ballou, 2003). This approach gives precise control of inventory level in particular supply locations. Pull strategy is especially popular at the retail level. It’s a system to control low inventory level in single supply locations. Each supply location is managed separately pursuant to its own territorial forecasts which are generated on the basis of concrete conditions of single territories. The scheme of both strategies is illustrated in the Figure 4. 5. ORDER PENETRATION POINT THEORY The foundation to comprehend and systematic work with so called order penetration point is visualization or mapping of material, information and financial flows of given inner or outer supply chain, see Figure 5. Fig. 5 General Visualization of a Supply Chain (Horáková & Kubát, 1998). The horizontal approach of logistics management is represented by material flow classification from the its management point of view. In general a material flow can be divided in two parts. First part is managed according to inventory level or program based on demand forecast, second part is managed accordance with customer orders, see Figure 6. Inventory management system (stock level management) gives impulse to start production or to buy the items to replenish inventory level at the moment when actual inventory level decreased under so called signal or order level. Inventory management based on program is extension of previous system by time magnitude. The impulse whose birth depends on up-to-date inventory level it’s here replaced by plan (scheduled program) to replenish inventory items. On the basis of demand forecast it’s determined expected time pattern of immediate inventory level. The needed terms to give job orders or to place buy orders are subsequently deduced from the expected demand pattern – forecast. Beside the management pursuant to customer orders, an assembly, a manufacturing and eventually also previous procurement of some raw materials and parts are started not until order receiving and its confirmation (Horáková & Kubát, 1998). The order penetration point (OPP) divides supply chain into two parts (Bazala & Kol, 2007: • scenario 1 – Untamed Economy, Impending Collapse, • the part where all is managed on account of plan (to the left from the OPP), there’s factor of uncertainty due to it’s important to have reasonable safety stock in the OPP, • the part where all is managed according to real demand level (to the right from the OPP), this system is typical by zero or minimal inventory level, all is only matter of capacity balancing and planning. The order penetration point refers always to certain product mix and business market. That means it relates to specific product (product family, product assortment) and to specific customers in some business territory. The determination of OPP position within the frame of inner or outer supply chain is strategical decision of company’s top management. It’s possible to distinguish 5 essential types of OPP which are illustrated in the Figure 7. Fig. 7 General Illustration of Supply Chain and 5 Possible OPP Positions (Horáková & Kubát, 1998). ally met by single production order. OPP 5 in suppliers’ warehouses, a company doesn’t have inventory. A purchasing of raw materials items is started until customer order received. Each customer order represents a specific project. The order penetration point defines two different areas in which the material flows are managed unlikely. There are used different methods to plan, to manage and to control of material flows in the mentioned supply chain parts (Horáková & Kubát, 1998). 6. COMMON STARTING – POINTS OF SYSTEM APPROACH To solve issues from various fields under current global, complex conditions there‘s a need of systematic approach – an application of notions such as methodology, methodics and method. The methodology can be defined as a system of broad principles or rules from which specific methods or procedures may be derived to interpret or solve different problems within the scope of a particular discipline. Unlike an algorithm, a methodology is not a formula but a set of practices (http://www.businessdictionary.com). Whereas the methodics can be circumscribed as approach repeatable and learnable through a step by step procedure. In simple terms it’s a sequence of steps to reach desired aim. The method can be generally described as an established, habitual, logical, or prescribed practice or systematic process of achieving certain ends with accuracy and efficiency, usually in an ordered sequence of fixed steps. Thus, the system approach can be understood as management thinking that emphasizes the interdependence and interactive nature of elements within and external to an analysed system or more precisely organization (http://www.businessdictionary.com). To tackle a problem nowadays usually requires usage both systematic approach and modelling, when the real systems are necessary to transform to general systems with mathematical – statistical expression and visualization. Order penetration point determination, Stock keeping units segmentation and analysis, Creation of inventory management system – push, pull, Integration with enterprise resource planning system of a company. Thus, by using this methodics it’s possible to design effective inventory management system step by step. As one can see, there are important logistics notions applied in the methodics that are: visualization, inner and outer supply chain, order penetration point and push / pull management systems that are necessary to define and analyse in desired detail level in given project to create inventory management system (Hart, Musil, & Taraba, 2014). 8. CASE STUDY The food industrial company, which is producer of beverages, needs to optimize few parameters of inventory management stated below (Hart, Musil, & Taraba, 2014), (Hart & Lisakoviča, 2011) : • level of raw material inventory (ingredients to produce soft drinks), • level of semi-finished product inventory (drinks mixture to finish soft drinks), • level of final products inventory (particular final products assortment), • level of plastics bottles inventory (to fill final soft drinks), • level of labels inventory, etc. (to mark bottles filled by final soft drink). To set optimal levels of particular kinds of inventory and to calculate required safety stocks to ensure optimal customer service is crucial to have well-developed inventory management system. On the basis of created methodics the company supply chain has been analyzed and it has been drafted a scheme of main material flows, see Figure 8. On account of visualized supply chain of the company it has been found that the entire final product assortment is manufactured by approach make-to-stock. Thus following this fact there has been designed push inventory management system which is based on demand forecasting subsystem of final products. How should be developed demand forecasting system in a company, see (Hart, 2010). Once the demand forecasting system has been created the desired levels of particular stock keeping units have been set in a way to minimize costs and maximize service level. At the end of the project the set inventory levels and actual forecasts have been entered into company information system (Hart, Musil, & Taraba, 2014). 9. CONCLUSION The absence of effective planning can lead in a company to unjustified resources allocation and to making of ineffective decisions concerning of enterprise management at its particular functional parts. As a result of it the customers can be unsatisfied with offered service level, it can increase the costs connected with uneconomical enterprise processes operation and an enterprise as a whole isn’t prepared for the market conditions of its business in the long-term period (Hart, 2010). The developed methodics mentioned and briefly described in the previous paragraphs can be used to create inventory management system in any industrial or service company, and thus it can contribute to improve entire enterprise management system. The development of new methodologies, methodics and their direct application in the industry or service fields is the right way under current businessinnovative environment to reach high level of competitiveness in the long-term sustainable growth (Hart, Musil, & Taraba, 2014). Carpathian Logistics Congress, pp. 199 – 205. Priessnitz Spa, Jeseník, Czech Republic, November, ISBN 978-80-87294-33-8. Pernica, P., (2005), Logistika (supply chain management) pro 21. století. 1. vydání. Praha: Radix, ISBN 80- 860-3159-4. Horáková, H. & Kubát, J., (1998), Řízení zásob. 3. přepracované vydání, Praha 1998. Nakladatelství Miroslav Háša – Profess. ISBN 80-85235-55-2. Ballou, R. H., (2003), Business Logistics / Supply Chain Management and Logware CD Package. 5th Edition, New Jersey: Prentice Hall, Inc., ISBN 978 -01-3107-659-4. Hart, M., (2010), The Approaches to Independent Demand Forecasting in an Industrial Company. Dissertation Thesis, VŠB-TU Ostrava, [cited 2014-04-25, 17:24]. Hart, M., Tomaštík, M. & Taraba, P., (2012), Demand Forecasting System as a Strong Tool for Effective Logistics Management. In Proceedings of the 9th International Conference on Logistics & Sustainable Transport, pp. 322 – 332. Faculty of Logistics, University of Maribor, European Association for Transport, Traffic and Business Logistics, June 14th-16th,2012, Celje, Slovenia, ISBN 978-961-6562-53-9. Hart, M., Lukoszová, X. & Tomaštík, M., (2013), Methodics to Create Layout Drawing Documentation as the Foundation for Logistics Management System of a Company. In: Proceedings The 3rd Carpathian Logistics Congress, Novotel Krakow City West, Krakow, Poland, December, ISBN 978-80-87294-46-8. Hart, M., Taraba, P. & Tomaštík, M., (2014), Drawing of Layout Documentation as the Basis of Logistics Management System of a Company – Literature Review, New Methodics, Case Study. In: Proceedings of the 3rd International Conference on Advanced Logistics and Transport 2014. Hammamet, Tunisia, May, pp. 395 – 400. IEEE, 345 E 47th ST, NEW YORK, NY 10017 USA. ISBN 978-1-4799-4839-6. Bazala, J., & Kol A., (2007), Logistika v praxi. Praha, Verlag Dashöfer. Wild, T., (2002), Best Practice in Inventory Management, 2nd Edition. Oxford, Butterworth-Heinemann. ISBN 978-0-7506-5458-6. BusinessDictionary.com. http://www.businessdictionary.com/, cited 2014-06-29, 21:36 Hart, M., Musil, M. & Taraba, P., (2014), Methodics to Create Effective Inventory Management System in a Company. In Proceedings of the 4th Carpathian Logistics Congress, High Tatras, Slovakia. September (in press) The paper has been written within the frame of project CZ.1.07/2.400/12.0069 – “Logistics Centre”. forecasting to make business decisions, logistics, demand management, international trade and industrial system management. He is a member of NOFOMA. Marek Tomaštík is an assistant professor at the Faculty of Logistics and Crisis Management, Tomas Bata University in Zlín. He has graduated at Silesian University in Opava at the Faculty of Philosophy and Science in 1996. The Degree of Ph.D. has been defended in 2008, field of study Management. He has worked as a researcher for the Tomas Bata Foundation in Zlín. He is engaged in business history, logistics management and management. Particularly he is aimed on history of management, personnel management and business especially focused on the business history of Bata Company. In the sphere of his interest he has published about 20 professional studies. He has also organized conference called “Tomas Bata Time and Society”. Pavel Taraba is a Deputy Head – Department of Logistics, Faculty of Logistics and Crisis Management, Tomas Bata University in Zlin. He has received his Ph.D. degree at Faculty of Management and Economics, Tomas Bata University in Zlin in 2013. His pedagogical and scientific activities are oriented especially on the field of Management and Marketing. He has experience with project management (in 2009, IPMA certificate, Level – D). Levine Company uses the perpetual inventory system and allows customers to use two credit cards in charging purchases ..